The Budapest Process is a consultative forum with over 50 governments and numerous international organisations, aiming at developing comprehensive and sustainable systems for orderly migration. During its more than 20 years of operation, the Budapest Process has developed from an information sharing tool between European countries in a pre-EU enlargement setting to a far-reaching European-Asian forum for improving migration management. It is chaired by Turkey and co-chaired by Hungary since 2006. The Budapest Process is managed through annual Senior Officials Meetings gathering all participating states. In addition, its geographic working group structure gives interested states in certain sub-regions an additional platform to discuss migration and related matters. 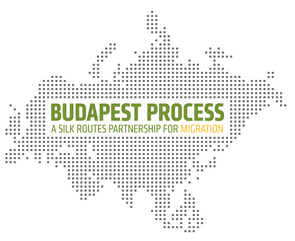 Celebrating its 20th anniversary in 2013, the Budapest Process witnessed an important landmark when the Istanbul Ministerial Declaration on a Silk Routes Partnership for Migration was adopted in Turkey. The Silk Routes Region refers to Afghanistan, Bangladesh, Iran, Iraq and Pakistan. Cooperation with these countries started in 2010 and since then these countries have successively joined the forum as new participating or observer states. The main objective of the partnership is to promote dialogue and mutual cooperation in managing migration flows taking place along the Silk Routes. Budapest Process has a permanent chair. - Regional working group for the Black Sea Region. The International Centre for Migration Policy Development (ICMPD) acts as the Technical Secretariat of the Budapest Process. November 19-20, 2018, Istanbul, Turkey, Senior Officials Meeting (Third Preparatory Meeting for the 6th Budapest Process Ministerial Conference). April 16-17, 2018, Istanbul, Turkey, Senior Officials Meeting (Second Preparatory Meeting for the 6th Budapest Process Ministerial Conference). December 14-15, 2017, Sofia, Bulgaria, Joint meeting of the Silk Routes and the Black Sea Working Groups on Return and Reintegration. November 27-28, 2017, Istanbul, Turkey, Senior Officials Meeting (First Preparatory Meeting for the 6th Budapest Process Ministerial Conference). September 20-21, 2017, Ankara, Turkey, Drafting Group Meeting for the Ministerial Conference in 2018. March 2, 2017, Istanbul, Turkey, Consultation Meeting “Ministerial Conference 2018 and the Global Compact for Safe, Orderly and Regular Migration”.